NPI’s base product is a suite of tools for application development generically denominated “Digital Shadow Caster tm” (DSC). DSC allows for the digital representation of objects (concrete or abstract) in applications called Digital Shadows (DS) that link objects through the events and actions taken on the objects. The management of the resulting network of object/events/actions relationships becomes a powerful tool for commercial and non commercial product management of the real objects being represented. Furthermore, the greatly reduced cost of operating a DS on behalf of communities of users makes this technology practically available to any entity, organization or individual. All objects of value from personal documents, collectors’ items, commercial products, produce, yachts, prize animals etc. can be represented within one or more Digital Shadows. 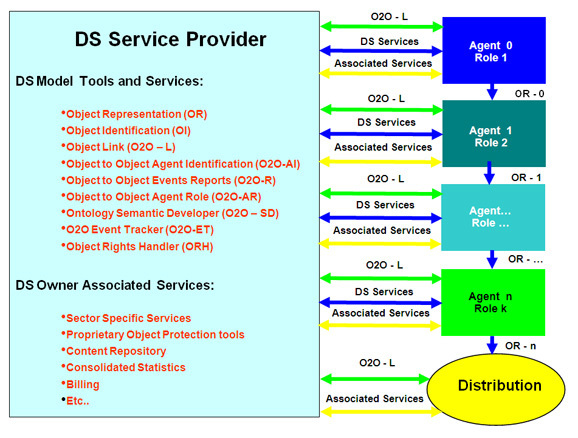 Thus throughout any object’s history and according to its owners wishes, all key information, actions and events throughout its life cycle can be made available to the appropriate DS using standard protocols and devices available to all users. In this way, when an object is identified anywhere, either by its intrinsic properties or any other identifier, its Digital Shadow can be consulted for multiple purposes such as sales management, product security and consumer protection. A world class luthier represents each of the instruments that he builds using a Shadow Caster Application Service and as a protection measure links her/his guaranty, maintenance and authentication of origin policy to the coherence of the objects DS when it changes ownership for example. Such that if the identity of a new owner doesn’t correspond to that recorded in the digital shadow by the previous owner, the object is no longer recognised by its originator removing much of the value of the instrument as a commodity as it nbecomes clear that it may not have been obtained legitimately. Would a value chain driven by child labour sweat shops use Shadow Caster? Would a premium quality produce based value chain use Shadow Caster? By answering such questions, it becomes clear that value networks based on inherent quality, value and transparency can benefit enormously by the use of Shadow Caster’s Value Network Representation to cumulatively enhance Value at each link of the Network right through to the end consumer. Furthermore, making the Shadow Caster information network a tool created by all for all, it becomes a means for generating trust for all users by promoting transparent tracking of the nature and origin of products or services in support of greater guarantees of quality, safety and ethical practices for all concerned.